The market for home energy storage options like the Tesla Powerwall has taken off in recent years, and costs are falling quickly. Many homeowners and businesses are thinking about adding a battery backup to their solar panel system. Shoppers using the EnergySage Solar Marketplace to compare solar quotes often ask a range of questions when considering the addition of battery storage. Below, you can find answers to the top four most frequently asked questions about retrofitting a solar panel system with a battery. How difficult is it to add a backup battery to your solar panel system? The level of difficulty associated with adding a battery depends on whether your solar panel system was designed with the intention of adding energy storage later on. If you have a “storage ready” solar system, you already have an inverter that can easily integrate a battery into your solar panel system. In this situation, a battery is relatively simple to install, and the installation process won’t require much additional equipment. If your solar panel system was not originally designed with the ability to add storage later, the installation will be slightly more complicated. In this scenario, you have two options: an “AC coupled” solution, or an inverter replacement. If you choose an alternating current (AC) coupled solution, your battery is installed with a separate inverter that is integrated into your home’s energy system. If you install an AC coupled solution, you can keep your solar system’s existing inverter, which can save money up front. You can also be more flexible in terms of the size of your battery, relative to your solar panel system. However, choosing an AC coupled solution does result in some efficiency loss over time. Most buildings use AC power, but your solar panel system produces electricity in direct current (DC) power. When your solar system’s inverter converts the DC power to useful AC power, there is a small amount of electricity that is lost in the conversion process. If you install an AC coupled battery backup system, there are additional conversion steps. As a result, AC coupled systems are less efficient than systems with a single inverter. Some batteries, like the Tesla Powerwall 2, come with a built-in inverter that can be installed alongside your existing solar inverter. They also fall into the category of an AC coupled solution. The alternative to an AC coupled solution is to replace your existing solar inverter with one that works with your battery. String inverters need to be replaced every 10 years or so, so if you have a solar panel system that’s at least five years old, you may want to think about swapping your existing inverter for an all-in-one option like the Pika Energy Islanding inverter. The primary benefit of a DC coupled solution is that your system will be more efficient – that is, it will lose less of the energy your solar panels produce during the conversion process. However, this option will be more expensive up front. Replacing your inverter to accommodate a battery can result in additional costs associated with system redesign and rewiring. What solar batteries are compatible with your panels? 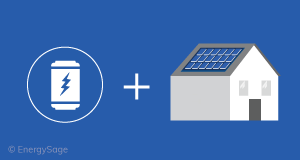 While there are some exceptions to the rule, most solar batteries designed for small-scale use are compatible with existing solar panel systems. The battery that you choose for your home or business depends on your reason for installing an energy storage system. Most batteries cannot take your home fully off the grid to the point where you sever your connection with your utility – they simply don’t offer enough storage to power your home for days on end in the event of an extended bout of cloudy, rainy, or snowy weather. If you want to go off grid with solar, you’ll need much more storage capacity than a Tesla Powerwall or similar solar battery can provide. 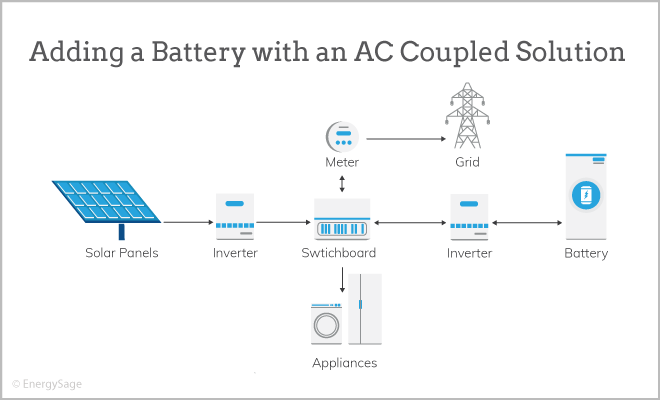 If your primary goal is to have a few hours of backup power in the event of a power outage, a larger battery like the Sonnen eco or the Pika Energy Smart Harbor battery will best serve your needs. However, if your utility has TOU rates or demand charges, and your goal is to reduce grid electricity consumption when rates are high, you can choose a smaller battery like the Enphase storage system. Every energy storage project is different. If you are interested in adding a backup battery to your existing solar panel system, make sure to share the specifics of your system, your electricity use, and your storage objectives with your installer to determine what kind of system is the best fit for your home. How much does the installation labor cost for a backup battery? Adding a battery to your solar panel system is a relatively simple process in terms of installation. You can think of installing a battery as more of an electrical project, rather a roofing project. When your solar panel system was installed, the company brought in an installation crew to work on your roof. By comparison, batteries are installed on the ground, usually in a garage or similar structure. Fewer people are required to complete the installation, and the logistics of the project are simpler (your installer won’t have to climb up on the roof!). Both of these factors reduce installation costs. Assuming that your solar panel system is in good working order and there are no major upgrades to be made, the labor cost to add a battery shouldn’t be more than a thousand dollars (this depends on the hourly cost of an electrician in your area). If you are also replacing your inverter as part of the installation, the job will take longer and cost more. Who should you contact if your installer doesn’t install storage? Ask your installer for a recommendation. Chances are good that you aren’t the first customer who has asked your installer about storage. They are the first place you should go to find out about other companies that offer storage options in your area. Seek referrals from friends, family, or neighbors. Referrals are one of the most common ways that property owners find an installer for a solar panel system. If you know anybody else who has installed solar (or even better, has installed a battery), ask them for their recommendation. Even if your installer doesn’t offer energy storage, somebody else’s installer will! Find an installer through battery manufacturers’ networks. If you know what type of solar battery you want, you can often go directly to the manufacturer and ask them to help you find an installer. Most battery manufacturers for home storage systems have their own network of installers that are trained to work with their equipment.